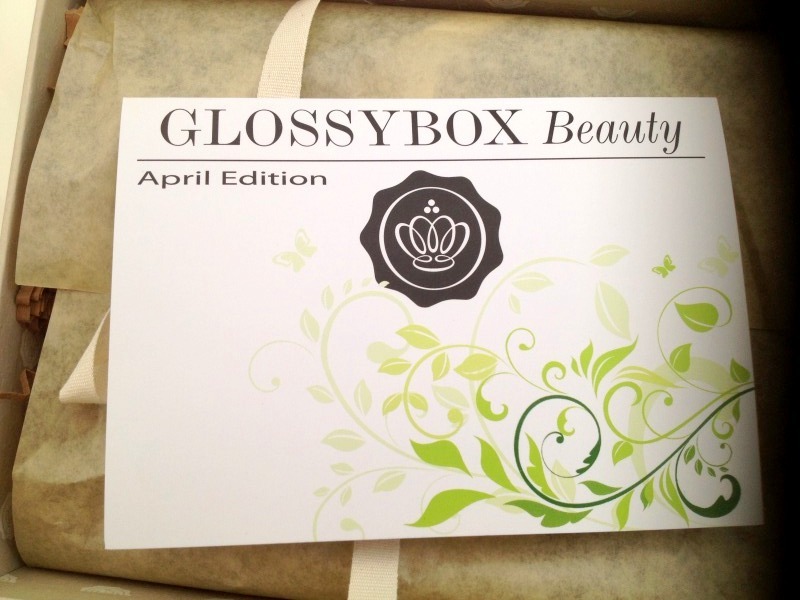 Saturday evening - GLOSSYBOX APRIL REVIEW. Partially happy... But not really, I'm still not sure about Glossybox... Although I loved the first one I got, only because it was from Harrods,i'm not sure it's worth £10.00. I'm about to talk to through why. Actually, it probably would be worth just £10.00 but they make you pay £2.95 for postage too which actually makes it nearly £15.00 for a box full of samples (when rounded up) which you can get for free! Nevertheless I do enjoy getting post,i'm so sad! 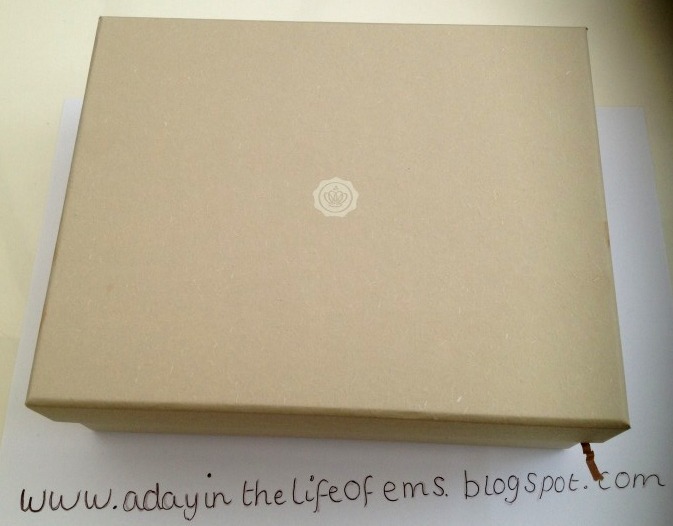 I especially love it when the postman delivers a pretty box in the post which looks beautiful in my bedroom! I just don't like how I had to wait a whole month for it, girls and their needs ey!! The style of the hand book that came with it was so so pretty, I love the natural elements to it and the green colours. 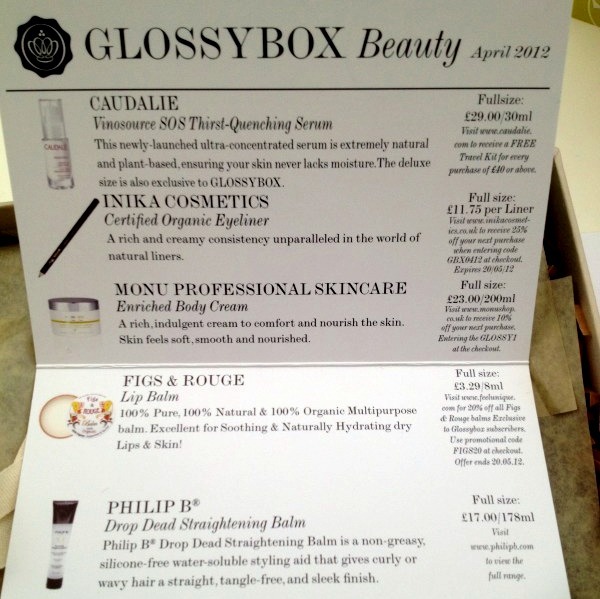 In terms of design and packaging, glossybox scores 10/10. The wrapping is always immaculate, the boxes are always beautiful and so are the shavings which go inside the box to pad it out. I love how it's tied with a ribbon and sealed with a pretty sticker. Unfortunately, this high standard just isn't consistent and the products really aren't good enough in this box! Yeah so I was quite disappointed when I saw that they'd given me a 'Figs and Rouge' lip balm. I do use lip balm and love it but I don't actually think this counts as a luxury sample. A lip balm is just something that everyone has and everyone needs, but I wouldn't deem it luxury, unless it was an Elizabeth Arden 24hour one or something. It's not that I don't use lipbalm because i'm all for cheap amazing products like lip balms, of course they are beauty must haves! 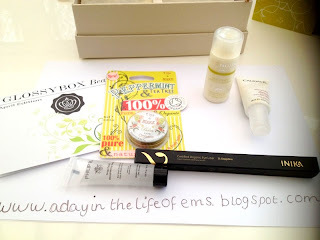 It's just the reason I get Glossybox is to try out some 'luxury' items so that when I do spend my money on more expensive items, I get stuff that I actually like. It is only worth about £3.00 which also annoys me because I have paid for a box of 'luxury' items, something that is £3.00 is not a luxury item in my eyes. I'd rather have a smaller sample of something more expensive, such as the Versace perfume sample I received in March's box. 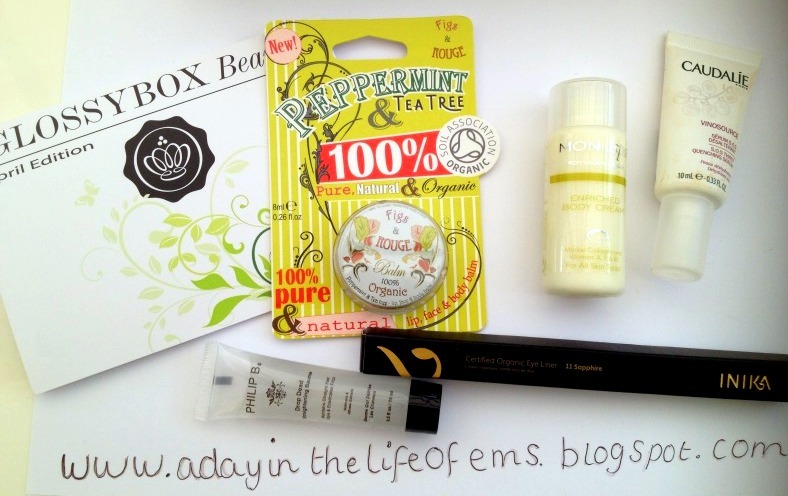 The best lip balm I have is by Rose&Co, it smells gorgeous, looks gorgeous and makes my lips feel amazing! I do love the fact moisturiser (top right) I needed a new moisturiser for the face and this is for face in need of hydration, 'SOS Thirst quenching cream' which is perfect for my skin. I haven't heard of the brand Caudalie before but it is a luxury sample as it is £29.00 for a full sized version, this is what I expect from the Glossy box, new exciting brands that are new to me and new exciting products wooo! The black box you can see is an eyeliner by another unfamiliar brand; INIKA. It's a lovely eye pencil and I was very much in need of a new one, but clearly they've just given everyone a colour that no one would wear. The colour is sapphire and it's like bright blue/green, I look like a clown with it on unfortunately. However, the pencil is lovely, it makes a lovely line, I just wish it was either a black or a brown. I don't think this colour suits my blonde hair at all. 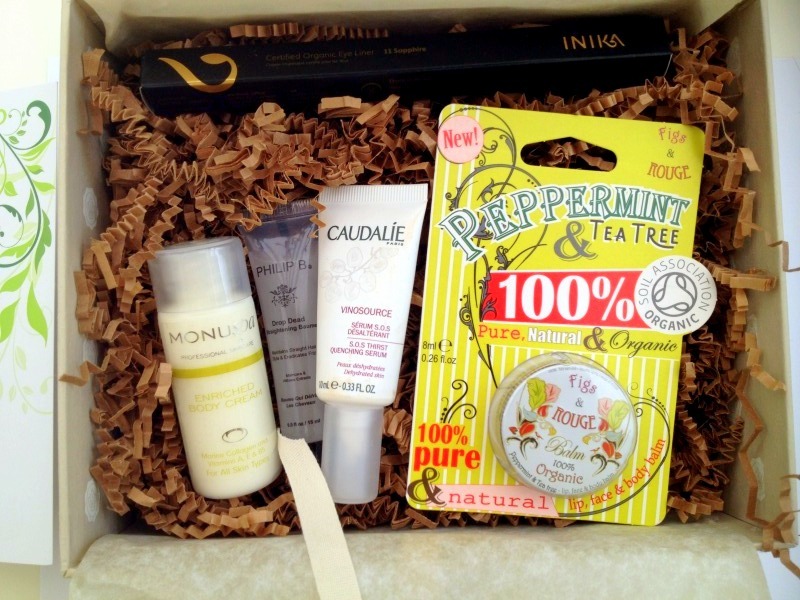 The Monu skincare moisturizer is £23.00 for full sized, so it is a decent product that they've included. I haven't used it yet but you can never have too many mositurizers so I am so happy with this item, I love finding new mositurizers and always use them after I shower so can't wait to use this tonight. I'm really excited to use Philip B's Drop Dead straightening balm, you're meant to put a dab on wet hair and then it is meant to dry straight, I will let you know how I get on with this when I use it tonight. I have a natural afro so I'm very very interested about this product! 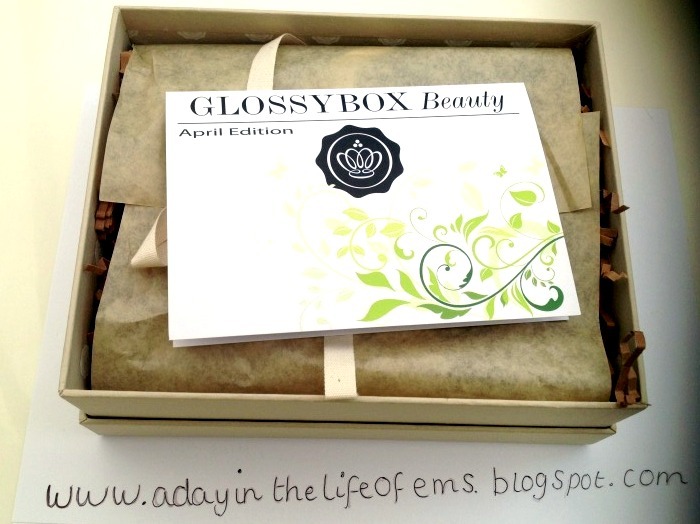 I'm always on the look out for new hair products so things like this really benefit me and make me love Glossybox, this is what I want from Glossy box, the 'luxury' items which they advertise. Don't get me wrong though, I'm not all about luxury items, I love my primark eye lashes (£1.00!!!) and my Vaseline, but I just don't expect this when I've paid to get a few 'luxury' things! 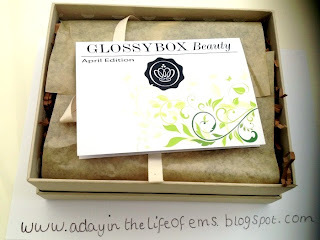 So, whilst I was a huge fan of Glossybox and think the concept is amazing, I think either the postage should be free, to lower the price to the simple £10.00 which they advertise, or, they should make the items much better and not slip up by adding little things that I could pick up from my local supermarket. I can't decide if I should wait one more month or cancel my subscription, I only started it as I wanted the Harrods box, I may keep it going to see if I love the next products as I love 3/5 products and I'm extremely happy with them :):):) I suppose i'm never going to love everything so I think i've done quite well actually! Do you use Glossybox or recommend it? Every person who's review of the April glossy box I've read got a bright colour eye liner, which is ridiculous because surely they would want to satisfy the majority? Anyway I got brown which I'm super happy about but I feel the same about the lip gloss. Also after next month I'll be cancelling my glossy box subscription! Hopefully they pull something amazing out of the bag to make up for a crap April! Hey. Really love the honesty of your post. 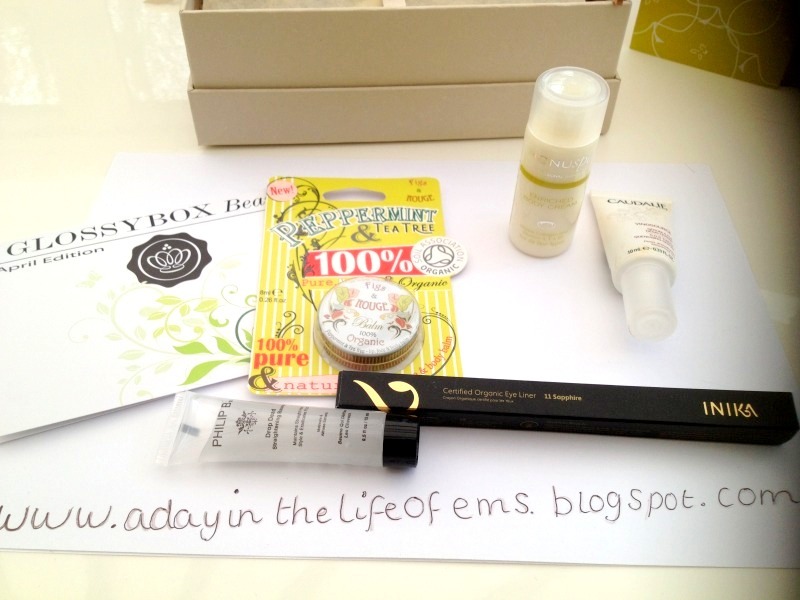 I wasn't too keen on the Glossybox but posted my first post on my blog about it.